This is an exceptional realisation of the roots of what Snarky Puppy is all about. Forget the connotations of the name. Forget the fact that the band thumbs its nose at the established notions of what music should be and who should be playing it. Forget about all that and welcome to Family Dinner Volume Two. It is one of those rare occasions when one is left with a feeling of being in the presence of the real thing and by that I mean the music of Snarky Puppy. The key to the success of this album (CD and DVD) is the quality of the musicianship – and of course, the atmosphere of something closely resembling the indoors of the Mardi Gras. Although the graphics of the package are very stark and beautifully graphic, I cannot help but recalling The Rolling Stones Beggar’s Banquet. I suppose that the studio setting and the feast-like setting of musicians, engineers and possibly invited audience members rings some bells. However, nothing can prepare you – and I mean absolutely nothing can prepare you – for the feast for the senses. Thanks to Michael League’s seeing a bigger picture than he has possibly ever seen before and the expert schooling of the superb group he leads the works contained in this package enthral, move and entertain with the dramatic and expressive elements that can only be experienced when superb musicians get together with like-minded mentors, collaborators and other wondrous artists seemingly from everywhere in the world. The project comes to us in two distinct forms. The DVD directed by Andy LaViolette and Michael League which gives us all of the music and then some, luminously and unfussily filmed live in a studio that looks like an old church, complete with a pipe organ. The DVD also intermingles the bonus videos with the ‘film versions’ of the songs themselves. The CD is more linear and features the songs in what appears to be a live session. However, both CD and DVD are mutually exclusive and should not be measured by the same metrics. The technical quality of both the elements in the package is consistently superb, technically and musically. 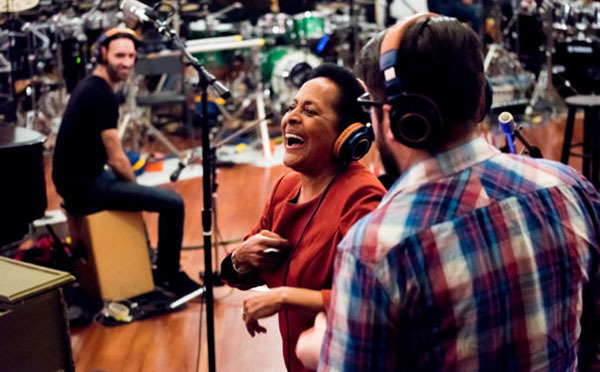 The heart of the music’s success – whether seen on film or heard on CD is the Snarky Puppy’s flawless music bolstered, of course, by the array of stars whom you do not normally hear on records like this. By ‘this’ I am referring to music where idioms collide, where cultures collide and where you get the feeling that even when nothing much is said (other than the music of course) everything that matters is understood. Is there really a universal language ‘spoken’ when music is played? Hakim Bey once famously said that (and I probably am paraphrasing here) the only universal language was the twittering of birds. But perhaps in this gathering of musical talent from Africa, Brasil, Sweden and New Orleans – yes that New Orleans – something universal is heard and sung and danced to and raised in celebration of the human spirit. Even though it is not stated in so many words, I believe that judging by the interviews and the whole experience of listening to/watching the event, if not a universal language, then certainly a universe of music happens just as it was intended. 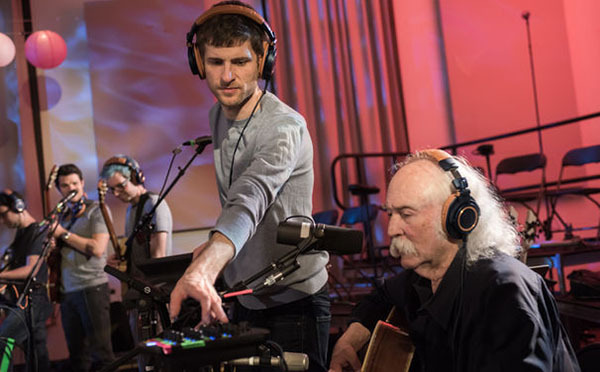 The music is gloriously purposeful and because you are so gob-smacked by the songs as they roll one after the other, it takes until David Crosby says a few words about the genesis of his song for you to feel the real reason why the music is being made. He puts it in the simplest of terms: the right kind of relationship to have with someone you love. And after listening to Crosby’s marvellous song, ‘Somebody Home’, you can make the connection between the music and the message of the project, extrapolating what Crosby says in the prelude to his song, to the entire album. It is a celebration of the triumph of the human spirit. So you go back to the album from the start again and you feel it in Snarky Puppy and Susana Baca’s version of ‘Molino Molero’, in ‘Soro Afriki’ with the soaring falsetto of Salif Keita. But you also feel it in Charlie Hunter’s solo on ‘Molino Molero’ and in the flute of Carlos Malta and the pandeiro of Bernardo Aguiar, in the magnificent playing of Väsen, the masterful musicianship of Jacob Collier… and on and on, and on… IN matters of rhythm and articulation the musicians do not put a wrong foot forward. The musicians constantly give the music room to register abs breathe before getting down to the business of conjuring forth a performance of wit, charm and gathering power. Orchestral texturing is beautifully realised. Michael League’s arrangements are superb, showing the importance of proportionality within and between tempi. He is no metronome-monger, nor do the performances of Snarky Puppy and its guests need to race in order to generate ‘symphonic’ momentum. There is fire in every song. Becca Stevens’ ‘I Asked’ burns with a blue flame, others like Salif Keita’s performance roars like a bush fire. Jacob Collier’s performance smoulders and catches fire by turns getting the percussionists going. 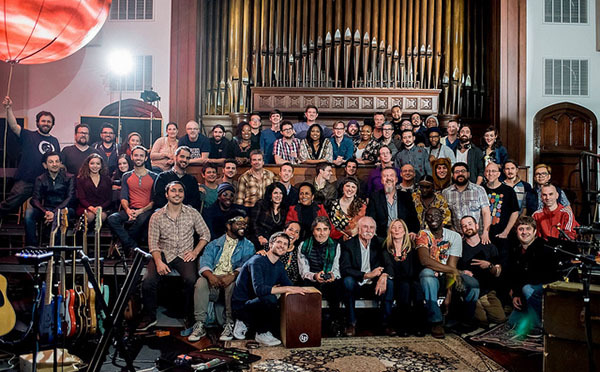 But let it be perceived that the whole project revolves around the guests alone, it must be said that none of this would have happened the way it did if it were not for the musicians of Snarky Puppy. Their playing is of superlative quality, the transparency of which is enhanced by the dispensations favoured by League of course, but also of Snarky Puppy’s keyboardists, brass, percussionists, drummers and vocalists. Each one of them elevates the music to the Divine. Tonal colours and textures abound in all the playing. The colour palette is broad and wonderful and if the Mardi Gras feeling is generated it is largely because of this. For me the CD was the first port of call, but I can understand why the DVD might be the place to start for anyone reading this as the cat’s out of the bag; the songs on the DVD and the CD are the same and the DVD has bonus songs woven into the film. But I have yet to tire of listening to the CD. Still the visual feast that the DVD has to offer might well be the draw for this wondrous package of flawless music and filmmaking. Bravo to the stellar cast of guests, bravo Andy LaViolette and above all bravo Michael League and Snarky Puppy. Track List: CD & DVD – I Asked (featuring Becca Stevens and Väsen); Molino Molero (featuring Susanna Baca and Charlie Hunter; Liquid Love (featuring Chris Turner); Soro Afriki (featuring Salif Keita, Carlos Malta and Bernardo Aguiar); Sing to the Moon (featuring Laura Mvula and Michelle Willis); Don’t You Know (featuring Jacob Collier and Big Ed Lee); I Remember (featuring KNOWER and Jeff Coffin); Somebody Home (featuring David Crosby). Bonus Videos: Be Still (featuring Becca Stevens and Väsen); Fuego y Agua (featuring Susana Baca); Shapons Vindaloo (featuring Väsen); One Hope (featuring KNOWER); Brother I’m Hungry (featuring Nigel Hall and NOLA International). Personnel: Guest Vocalists: Becca Stevens: vocals, acoustic guitar, charango; Susana Baca: vocals; Chris Turner: vocals; Salif Keita: vocals; Laura Mvula: vocals; Jacob Collier: vocals, piano, harmoniser; Genevieve Artadi (KNOWER): vocals; David Crosby: vocals, acoustic guitar. Guest Instrumentalists: Charlie Hunter: 7-string guitar; Jeff Coffin: tenor saxophone, alto flute, flute; Carlos Malta: fife, bass flute, alto flute, soprano saxophone; Bernardo Aguiar: pandeiro, percussion; Michelle Willis: pump organ, vocals; Louis Cole (KNOWER): drums; Roger Tallroth (Väsen): parlor, 12-string acoustic guitar; Olov Johansson (Väsen): nykelharpa; Andrei Ferrari (Väsen): percussion; Big Ed Lee: sousaphone; Carolina Araoz: vocals; Animata Dante: vocals; Amos Gohi Baraon: vocals. Snarky Puppy: Michael League: electric bass, ukulele bass, Moog bass, vocals; Bill Laurence: keyboards, vocals; Cory Henry: keyboards; Shaun Martin: keyboards, vocals; Justin Stanton: keyboards, trumpet, vocals; Bob Lanzetti: guitars; Chris McQueen: guitars; Jay Jennings: trumpet, flugelhorn, vocals; Mike ‘Maz’ Maher: trumpet;, flugelhorn, vocals; Chris Bullock: tenor saxophone, flute, alto flute, vocals; Robert ‘Sput’ Searight: drums, percussion; Larnell Lewis: drums, percussion; Nate Werth: percussion; Marcelo Woloski: percussion with: Candy West: vocals; Peaches West: vocals; Rachelle Searight: vocals. NOLA International: Nigel Hull: vocals; Big D Perkins: electric guitar; Ivan Neville: clavinet, vocals; John Gros: organ; Brian Coogan: piano, vocals; Big Sam Williams: trombone; Khris Royal: alto saxophone; Terence Blanchard: trumpet; Donald Ramsey: electric bass; Jamison Ross: drums; Terence Higgins: drums; Mike Dillon: percussion; Jason Marsalis: percussion. 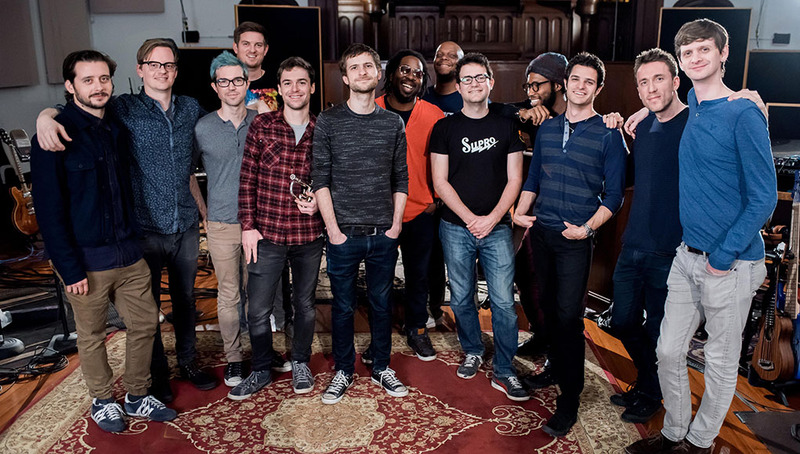 With every new project–hell, with every show they play–Snarky Puppy hopes to do something they’ve never done before. 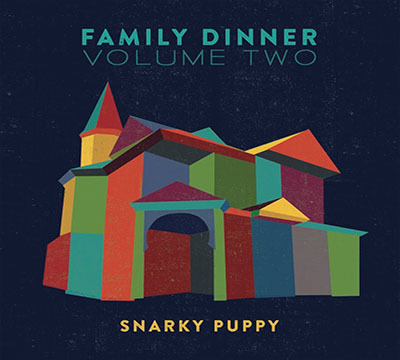 With their new album, Family Dinner, Volume 2, the eclectic, unclassifiable jazz/funk/global collective has set their sights higher than ever.